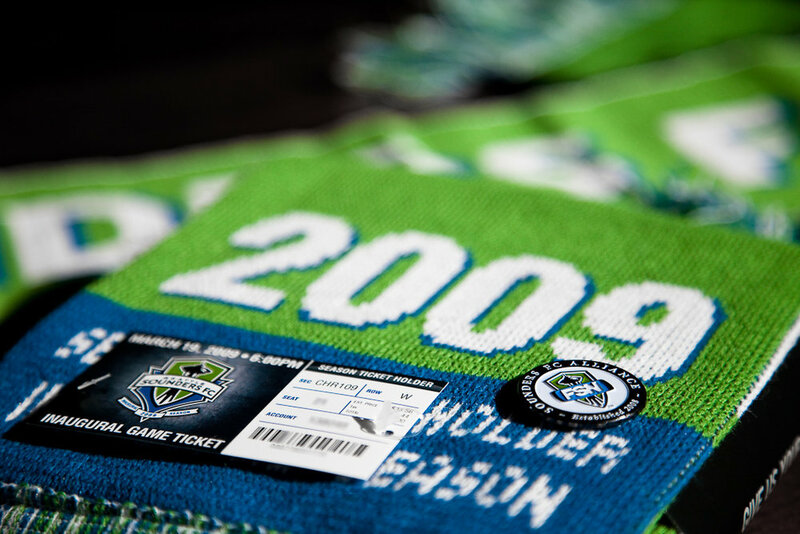 Our partnership with the Sounders started in 2007 when their ownership group approached us to help them launch a professional soccer team in Seattle. At that point they had nothing more than this logo, no coach or players. The original "Give Us Your Full 90" mantra board. We took a different approach to the launch. Instead of marketing star players, talking about passion and excellence while asking consumers to buy tickets and merchandise, we talked about the culture of soccer and what it means to be a fan within that culture. 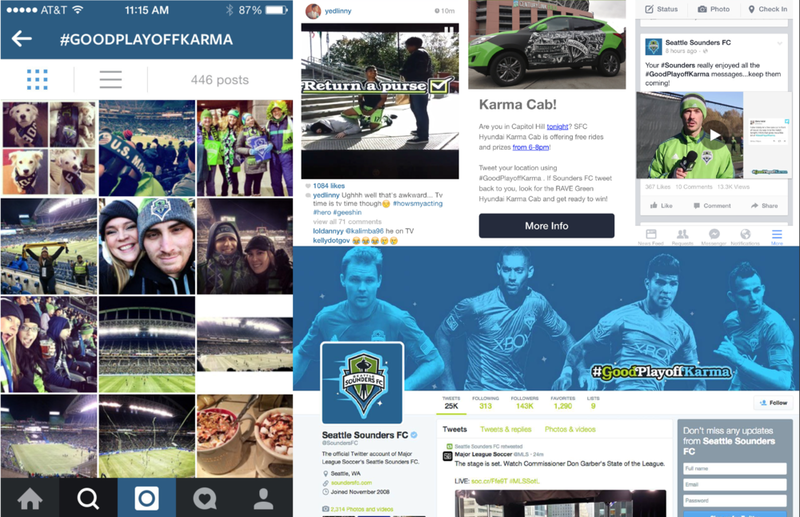 Our goal was to make Seattle the cultural hub of professional soccer on the West Coast. We believed in building the culture first, then the tickets and merchandise would sell themselves. 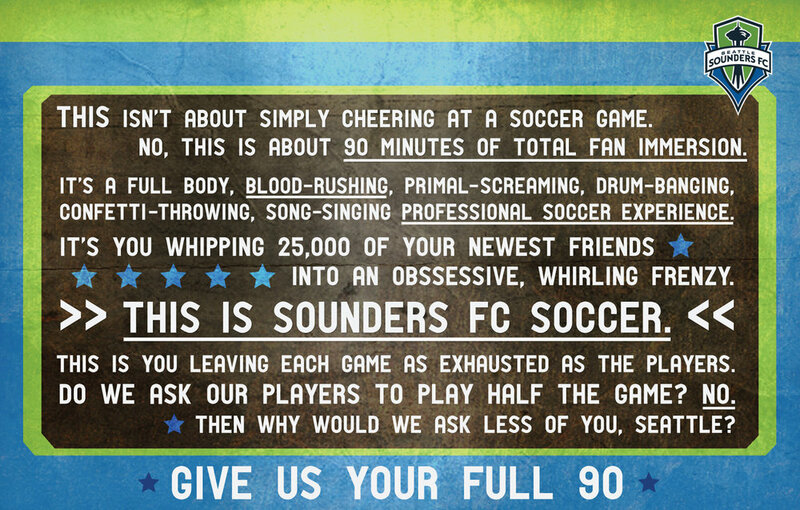 That became the Sounders FC brand, “Give Us Your Full 90”. The ticket to the first game was a scarf. The very first "March to the Match". The first match vs. New York Red Bulls, March 2009. As the years went on, players emerged that were crowd favorites, we leveraged those players and gave fans access to players and their personalities. As a producer I helped concept and execute countless integrated campaigns for each new season, friendly matches, rivalries, playoffs and season ticket renewals. 2009 Renewal Campaign: "Sounders Serenade". 2015 Renewal Website: "SOUNDERS 'TIL I DIE". 2016 Social Campaign: "Good Playoff Karma". Stills from "Good Playoff Karma" video content. The results are that the Sounders have lead the MLS in attendance, season ticket renewals, and merchandise since coming into the league. They are in the top 10 of soccer viewership in the world.